Hanging on the wall is a pair of snow shoes and a trap. The items are in a barn at the Last Mountain House Provincial Park. The wall is made of logs and mortar. The snow shoes netting is damaged. Pair of snowshoes and a trap in the Warehouse/Barn at the Last Mountain House Provincial Park, Saskatchewan, Canada. 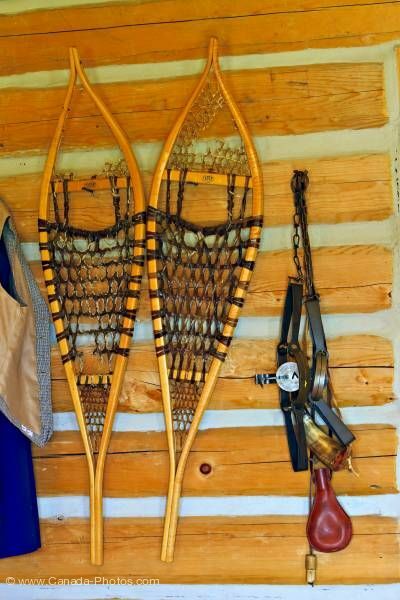 Aair of snow shoes and a trap hang on cabin walls, Last Mountain House Provincial Park, Sask.